Ride has been producing high quality bindings for years. The KS may look simple, but thanks to all of those years of research and development, we know what works and what doesn’t. 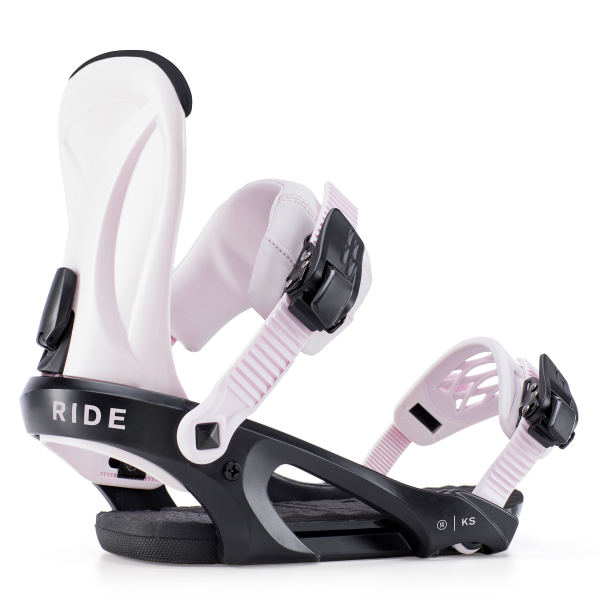 The KS may look simple, but features like Wedgie™ Footbeds align your knees for a more comfortable riding experience that helps you avoid stress and injury, convertible ThinGripPlus™ Toe Straps feature an over-molded rubber web for a snug boot grip, and AstroGlyde™ OG Ratchets allow for easy entry and exit. These proven binding technologies increase the performance of the soft-flexing KS and allow you to progress your riding, regardless of your ability level. An ultra-light footbed that uses subtle angles to align the ankles and knees to a more natural and comfortable position. The angle also gives leverage to press the board for huge pop, without affecting your preferred stance width. Offered in 2 levels to accommodate your physical stance and riding style – The standard Wedgie™ is ideal for riders looking for added control and pop, while Wedgie™ 4.0 is great for riders looking for the utmost drive and ollie pop, along with those that prefer an extra wide stance. A lightweight injected polycarbonate chassis with stance correct heel cup. Allows for a budget friendly option that maintains RIDE DNA with a progressive look.